We have just tried our GUI tool running on Mono 1.1.18 on Fedora. Well, it seems mono folks are getting closer and closer, and our application behaves better and better. There are still many issues to solve, but it seems they are progressing really fast. 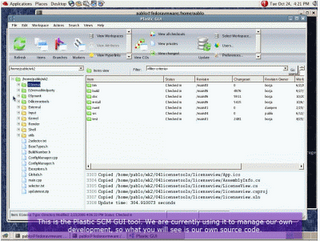 If you want to have a look into, click on the image to see a video (Flash) making an small tour through Plastic SCM GUI on Linux.